Most of us are so focused on what we need to get done that we often tend to forget what’s truly important in our life. If you are someone who has gotten into the habit of working with a “To-Do” List, then you know that this is a never-ending story. Chances are your list gets longer while the days get shorter to complete everything you want to do. Why is it that doing has a higher priority than being? Isn’t this why we are called human beings? The weekend is coming up and you may be well advised to sit still and think about what you want to let go off. You could also make this a family exercise. What do you want to stop allowing into your life? 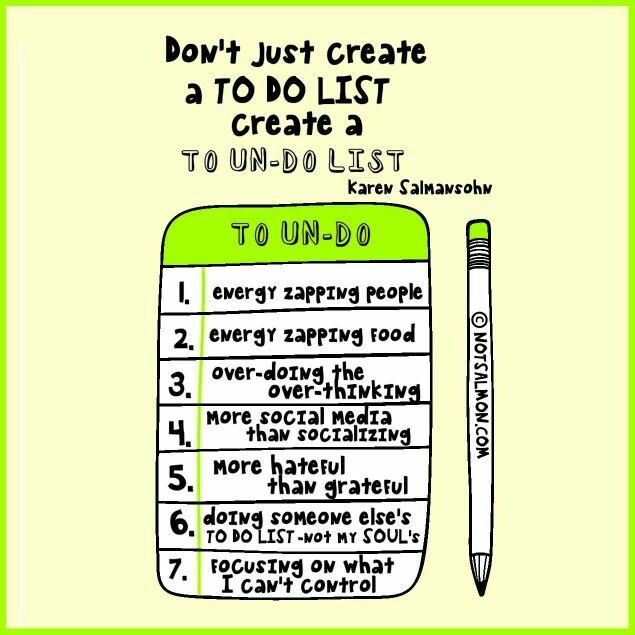 Fill your “un-do List” with all the things that you want to see less in your life. Are you ready to start your “self-care bullets”?